A large number of people around the globe takes the help of questionnaires and surveys to gather a wide range of information and answers to some crucial questions. These surveys and questionnaires are designed in such a way that would evoke an accurate response from the survey takers. They are conducted for a variety of reasons by a wide number of sectors like business, marketers, researchers, etc. Some surveys may be designed to get a to-the-point review on their products while others solely for general discussions and polls. 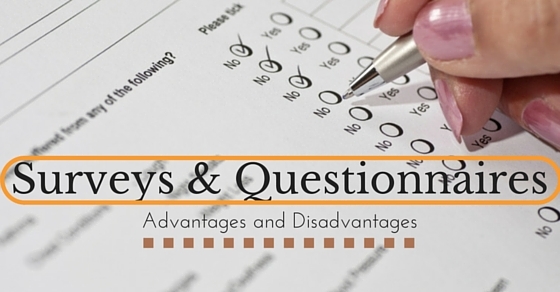 So let us discuss some advantages and disadvantages of questionnaires in research and surveys in details. We all know that there are billions of web users scattered all over the world. Thus, a huge amount of information in any form is or can be collected for various purposes. This is a positive point for all the survey poll conductors, who want a large amount of responses in a short time. Also, this target can also be achieved through offline surveys, but online once are more effective. Since you get the large crowd as a target, you can easily evoke some answers for your survey. Additionally, sharing through various social media accounts also increases traffic for the questionnaires. Thus, increasing the amount of information that should be achieved. Researchers use these questionnaires as a bait to acquire accurate answers for their scientific researches and theory. They use the crowd to get specific answers related to their theories to check the validity of their research. Also, a through scientific analysis is conducted to gather opinions and data regarding people’s opinion on any specific topic. This is done to conduct a research on the basis of information gathered from the people through these surveys. They are found to be pretty effective when opinion is taken into consideration from a lot of users. Surveys and questionnaires are conducted, taking various groups of people separately. If a group of learned people is subjected to a particular survey, their answers may open up ways to a brand new theory. Researchers take the help of these kinds of questionnaires and surveys to get solid information on how to approach for a new theory. So practically, conducting surveys can pave a way to a new theory for researchers. Also, existing theories can be tested and opinions regarding them can be collected for anytime use. Proper management can easily be achieved through conduction of surveys and questionnaires. Create a set of questionnaires or conduct a survey, and you get thousands of opinion for a single query with the easy manageability feature by default. If the conduct is online, then there is nothing practically to be done extra. The software manages by itself, managing all the data. Also, if the questionnaires are done offline, proper storage should be taken into account for efficient manageability, like formatted sheets or keeping latest answer at the top. Creating questionnaires and surveys clarify any doubt regarding any particular issue or a social cause in general. It becomes easy to get people’s opinion on the particular matter without much hassle. It is much easier than asking individually a person of his/her opinion since all you get to do is prepare a set of questions for your survey and questionnaires. Especially if they are paid surveys, people tend to attend it more than free surveys. All you do is prepare your queries for the survey and get a huge amount of response for a single survey conducted. A single survey has the capacity to evoke a response from thousands of users online as well as offline. Just tagging the survey as paid can attract a lot of opinions. And at the end of the day, survey results would be ready with thousands of answers. Surveys and questionnaires are a good source to judge how much opinions differ from each other. This may lead to the solution that one intends to find. Especially for researchers, surveys may prove fruitful since a large number of opinions from a wide class of people would come for analysis. This is an effective way to measure the deviation that is by how much each opinion differs from the hypothesis originally made. A lot of people can be involved in this survey processes to get a wide variety of results. Opinions differ from person to person. Therefore, different opinions will come to the surface when the amount of crowd involved is increased. Surveys and questionnaires also don’t have any specific limit for people. Any number of user can get to attend a survey. If a huge amount of data is collected through questionnaires then through comparison, the right solution may end up with the survey conductor. With a large amount of data, a proper analysis can be conducted to get to the right conclusion. Especially in research, the comparison is widely done, since they need the proper solution to their issues. Conducting questionnaires and surveys are considered to be an unbiased approach for getting information that helps in making a decision. Most of these decision-making surveys are provided with options like yes no or no idea. While some media use this kind of surveys to gather people’s opinion on a particular topic that may be related to any public figure or any incident that is causing controversy throughout the region. This opinion can give a result of the sensible decision as well as well analyzed answers to one’s questions on any particular topic as well as can help in reconsideration of the decision. If a psychological survey is conducted, then getting the proper solution becomes more and more difficult. Since every person is different physically, socially and mentally, the emotion factor will vary from person to person. Therefore reaching to a proper conclusion becomes hectic, since people tend to give different answers in accordance with their own emotions and feelings. Providing false information in surveys is a very common thing that happens. If the survey is paid, then people will lie in order to get the survey done as the eligibility justifies. Thus giving rise to a huge amount of false information that may harm the overall reason for which a survey or questionnaire is created. Therefore, necessary precautions should be taken with the help of software to detect any mismatched information that may lead to falsehood. A substantial variation in opinion is a must while conducting surveys or preparing questionnaires. But if every opinion of the user who has gone through the survey has a different opinion, then it becomes difficult to come to a right conclusion. In that case, options should be provided for better classification and to decrease excessive variance in opinions. During online polls, which are also a part of surveys, the formation of clash or rivals is an obvious thing to occur. Surveys may end up forming a group and dividing people on the basis of their opinions. This may lead to hostility among each other and result in discord. So, it is always advised to play safe and take proper steps to prevent dispute like providing safe options to choose, for instance, yes or no type options, for the proper conduct of the survey without the clash of opinions. Sometimes, people tend to give opinions on crucial matters without giving proper thought to the questions asked. For instance, people may sometimes go on describing a particular issue while question demands only a yes or a no. At the same time, people just overlook the question and simply give mindless answers while questions ask to think. This thoughtlessness and unmindfulness of users make conducting survey a difficult task to perform. Yes, it is true that conducting surveys and questionnaires give a diverse range of information, but many of them prove to be null and void since they have no relation to the questions asked. This unwanted information may lead to frustration and eventually, makes difficult for the person conducting the survey, to compare results and get the correct answer. Moreover, a heavy amount of unnecessary information may consume the unnecessary time of the researcher or marketer. Getting a huge number of solutions become easy, no doubt, but there may not be any increase in quality of answers. Sometimes the objective for which a survey is not fulfilled since low-quality results are obtained from the surveys and questionnaires. Therefore ensuring to include those groups of people who are fit for the survey is a must. Simply conducting a pre-survey regarding the personal information of the user can ensure eligibility of a person for the survey. Although a large amount of information is collected, only a part of it is put to use. According to a study, it is found that those conducting surveys and questionnaires taking a large group of people end up utilizing only 5-10% of the total data collected. That results in massive wastage of information. Conducting surveys and questionnaire taking a lot of users can become very tedious as well as consume a lot of your time. Collecting, analyzing and concluding can take away a lot of your valuable time. Sometimes, the questions asked during surveys or questionnaires tend to make people confused. So, unable to decide what to give as an answer, they provide you with vague solutions or sometimes useless answers. Some online surveys too, provide you with typically confusing questions that are really difficult decipher. The only option the user gets is either to answer with some mindless answer and complete the survey or leave the survey unattended. In order to conduct a safe, unbiased survey or questionnaire, you need to follow a few tips to ensure perfection. Ensure that the inquiries asked, give the precise information that the survey or questionnaire is expected to analyze. Try changing the question or more like twisting it a bit, so that the person giving the survey may provide you with the answer you actually require. Twisting questions is an art by itself, make sure to perfect it to ensure perfect conductance. Try using generalized question for the survey instead of biased one to get the perfect opinion of a survey taker. Avoid placing questions that would result in unnecessary answered that you don’t require. It is always nice to have knowledge a bit more, but only those which are necessary. Use simple clear language and readable font to ensure better results. The study has proved that fonts that have better readability have given better results than stylish fonts.all remember you are designing question for every age group of user. Keep the flow going- don’t suddenly jump to a question on defense after a question on politics. Don’t prepare haphazard questions, it tends to irritate users. Keep the number of questions as low as possible and try asking to the point questions. Avoid vague questions as far as possible. From the above context, it is derived that there are equal pros and cons of surveys and questionnaires. For some, surveys may become a source of ample opinion and way to make the right decision, while for the others, it can be used for getting reviews for their products or formulating a new hypothesis. But in general questionnaires and surveys are required in order to get the opinion of mass at once, and so, make the process of decision-making a lot easier. Do keep in mind the disadvantages while performing surveys and act accordingly.